The Off-Campus Housing Services within Housing and Residence Life at the University of California, Merced, works to provide students with information, resources, and advising on off-campus housing. OCHCs work to provide students with information, resources, & advising so they may make informed decisions about living off campus and help them become responsible and knowledgeable renters. 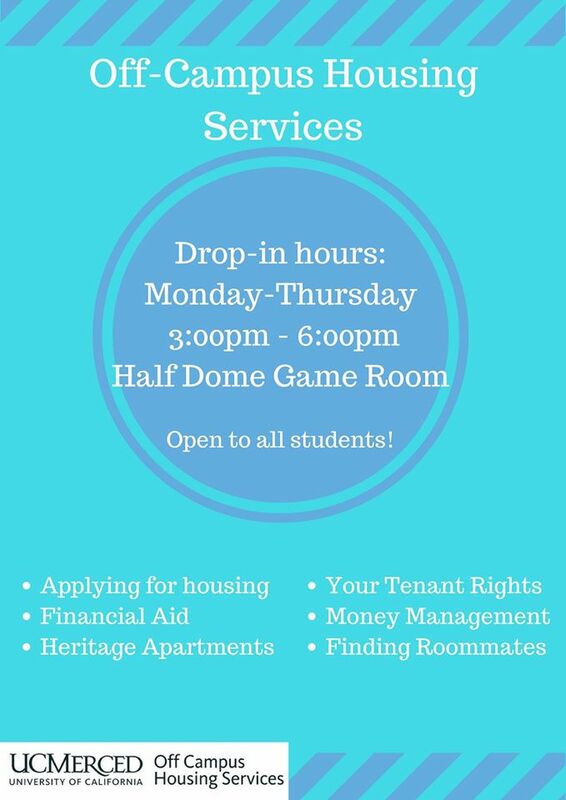 Off-Campus Housing Services help students transition to living off-campus through workshops, individual consultations, and a community rental database. Off-Campus Housing Services does not complete housing applications, place students, take deposits, or work with landlords and property management companies on behalf of students. Housing and Residence life does not assume responsibility for a property or rental using resources we have provided. Submit roommates available and needed. Note: There is a $21 service fee per month for all property listings. You need to enroll before posting listings. Click the orange "property providers" button for next steps. We are very fortunate to be a University of California campus located in a community that offers a wide array of off-campus housing options (apartments, homes, condo/townhouses and rooms for rent) at affordable prices. You are encouraged to use the various tools available to find a housing accommodation that best suits your lifestyle. By using the Off-Campus Housing Database provided by UC Merced, I agree to abide by all public laws and regulations pertaining to the rental of housing accommodations, including not discriminating on the basis of RACE, COLOR, RELIGION, NATIONAL ORIGIN, AGE, GENDER, MARITAL STATUS, DISABILITY, or SEXUAL ORIENTATION. However, I am entitled to specify the gender of a prospective tenant for a single room in my home. The University accepts no responsibility for any actions arising from these listings. The University has not accepted, approved or disapproved of this facility nor investigates, endorses or guarantees the suitability of those responding to any listing. Your listing will be activated on the next business day following submission and will be posted for 30 days. As a courtesy to our clients we ask that you notify us once you have found accommodations or filled your vacancy. We reserve the right to remove or withhold any listing. When you fill out the registration page, we require listors to provide their physical street address. "This address must be the usual street address at which personal service may be affected of each person who is the owner or is authorized to manage the premises, as required by law. This information needs to be made available to your tenants (Civil Code § 1962)." The Community Housing Office may provide this information to tenants upon request. Graduate students looking for housing information should contact the Graduate Resource Center within the Graduate Division, gradresources@ucmerced.edu.